It's Dragon Boat Festival (Duan Wu Jet 端午節) again on Thursday 28th , which falls on the 5th day of the 5th month of Chinese lunar Calendar every year. 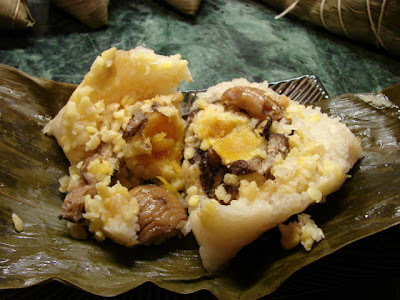 Duan Wu Jet always celebrated by the racing dragon boats and eating rice dumplings or Zhongzi 糭子. No idea whether there will be any dragon boat racing anywhere in UK. 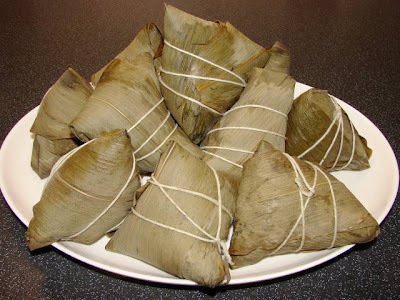 I love zhongzi, it's a rice package normally wrapped by bamboo leaves with glutinous rice, meat, mushroom etc... It's a full meal on its own, great to eat anytime of the day, any day of the year, not just Duan Wu Jet. I was in Chinatown last week and saw the dumplings selling for nearly £3 each! Such a rip off! For the ingredients the most expensive possibly the salted egg yolks if bought but I had DIY salted eggs which saved me few pennies. Also I used DIY dried chestnuts, dried near last Christmas when fresh chestnuts were cheap. Yesterday I spent several hours making these yummy rice parcels. Like most Chinese I always make loads, some will be given to friends and family and some keep in fridge to be eaten within the next few days and the rest will go into the freezer. This recipe is typical Cantonese style - Five spice savoury zhongzi. For the rice dumpling here is the list of prepared ingredients and a slideshow showing how to wrap the dumplings. This recipe will make around 35 dumplings. Method see slide show below. Cut pork into thick slices, rub with salt and sugar then keep in the fridge for 2 - 3 days. Night before use, take the pork out and rinse of all the excess salt. Cut into small chunks and mix with five spice, keep in fridge ready for use tomorrow. Finely chopped about 4 - 5 shallot (walnut size) and 4 - 5 cloves of garlic, then fry with 1/2 cup of oil till shallots and garlic turned light golden brown. Turn heat off, the shallot and garlic will continue to turn a darker brown. Leave to cool. Soak the leaves night before with a clean bucket. Next day blanch in boiling water in several batches for about 8 minutes each batch till the leaves are softened. Then soaked in clean tap water ready for use. Soak the rice at least 5 hours or night before, drained thoroughly. Then mixed with 8 tbsp of the shallot/garlic oil (with bits), 2 tsp of salt and 4 tbsp of light soy sauce. Soaked the mushroom with warm water till softened, cleaned and cut into slices. Squeeze of excess water and marinate with 1 tbsp of shallot/garlic oil and dash of light soy. Soak the chestnuts night before. Next day boil with clean water, simmer for about 30 -40 minutes till softened. Drain and remove all skin. Large pieces can be broken. Soak for about 1 hours or till softened, drained and ready to use. Can use bought/DIY salted eggs, use only yolks. White can be retained for steaming minced pork or making egg flower soup. For a cheaper options can DIY you own salted eggs, will post recipe in later post. If not available can leave out. 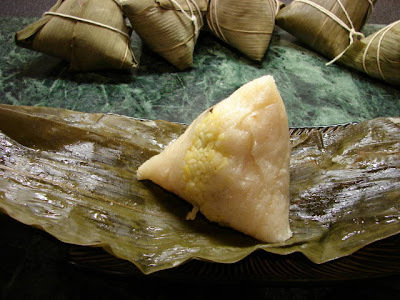 There are also sweetened zhongzi with red bean paste or lotus seed paste as the filling. Sweetened zhongzi the rice is usually has lye added to make the rice looks yellow with a lye flavour. Hi Sunfower, thanks for dropping by my blog :), love your blog too :). here my another blog more on cooking http://mimi-fingers-tips.blogspot.com/ have time to dro by and give me your comment, critic also never mind :D.. This is really useful! Mine always end up with holes. What if I want to use black-eyed pea (眉豆/米豆) instead of mung bean for the fillings? How do I prepare it? Thanks. Soak the black eye beans overnight. Most people will add them raw to the rice or filling. I prefer to parboil the beans for about 12 - 15 minutes to ensure the beans will cook thoroughly.